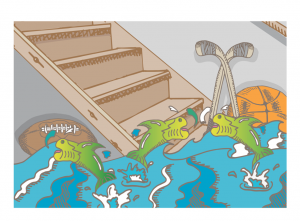 Is your basement constantly damp? Do you notice mold starting to grow on your basement floor or walls? If so, it’s highly recommended that you have your basement waterproofed by a professional basement waterproofing company. However, before you go out and hire the first company you come across, it is wise to do some research. This is the best way to ensure that you hire a company that is both legitimate and competent. Here are 5 things to look for when hiring a basement waterproofing company in Oak Brook, Illinois. One of the absolute most important things to inquire about when choosing a basement waterproofing company is insurance. If the company you hire doesn’t have insurance, you could be held liable for any damage that is done to your property while it is being worked on. You could also be held liable for injuries to the company’s employees. However, if the company has insurance, there’s no chance that you will be held liable. At a minimum, the company you hire should have general liability insurance and workers’ compensation insurance. Another thing to look for when choosing a waterproofing company is ample experience. Companies with a good deal of experience under their belts are much more likely to be competent than those with very little experience. We recommend choosing a company with at least 3 years of experience in the waterproofing field. A company that has provided quality work for this amount of time has likely proven its mettle. When speaking to your prospective basement waterproofing companies, you should inquire about their working styles and practices. This is necessary in order to ensure that the company you hire truly knows what it’s doing. If a company can’t give you a concise, yet detailed answer as to how it performs specific types of work, you should probably think about looking elsewhere. After all, you want to hire a company with great expertise in waterproofing. Experts will leave you with no doubt as to how they get their work done. Non-experts will often leave you questioning their skills and knowledge. Waterproofing companies charge a wide variety of rates. The goal is to find a company that charges rates that are not too high, but not too low either. High rates might deplete your budget, while low rates are typically indicative of sub-par service. When speaking to prospective companies, you should ask for estimates up front. Any reputable basement waterproofing company will be happy to provide you with an estimate of the work that you need done. Perhaps the best indicator of a good company is a good reputation. If the consensus feeling about a company is positive, that company has likely served a long line of satisfied customers. If, on the other hand, the consensus feeling is negative, that company has likely underperformed on many occasions. To get a feel for a company’s reputation, you should browse some review websites. Google, Yelp, and Facebook will provide you with a variety of reviews from past customers. If you’re reading this blog post, it’s likely because you’re looking for a reputable basement waterproofing company in Oak Brook, Illinois. If so, you’ve found one: ULB-DRY Waterproofing. We are an award-winning business with years of waterproofing experience under our belt. Fully licensed and insured, we offer top-notch waterproofing services at affordable prices. Contact us today to discuss your waterproofing needs!